The last post I wrote was about turbulence and noise. Well, I’m still working at it, hopeful that some setting will work. On the way, we have experienced some really amazing roads, landscapes and riding. This is a little trip summary. We rode from Windsor, California, to San Francisco’s Golden Gate State Park, to Monterey, Big Sur, Atascadedero, Bakersfield, Mojave. Today, we go to Death Valley, to stay at Panamint Springs. 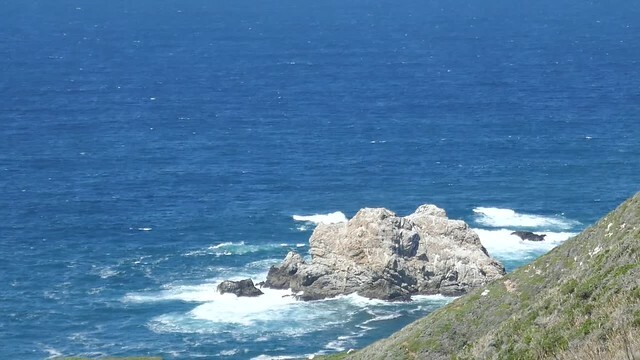 Thursday, March 22, we rode from Windsor to Santa Cruz, on Highway 101 through San Francisco, (SFO) … It was a wild and crazy ride! Highway 101 can be a very fast freeway, and it was for the most part; and then, it was very windy. spitting rain, and lots of traffic. There was an accident or slow up on the bridge, so there was tons of congestion. We really couldn’t enjoy going over the bridge, b/c it of the accident, the wind, having to pay such attention to the conditions. We made it to the Golden Gate state park, where we took a short break. Southern California! Can’t quite believe it, but we have travelled quite a distance, and this is very new territory for us! We left Golden Gate state park around noon, heading for highway 1. There was a detour, taking us one block inland, which was a good thing! It was very windy!!! So windy, that it was hard to hold the bike up! We took our time with this ride, still figuring out the windshield spoiler, (varying degrees of success this day), but also, to go along the California Coast. The land that John Steinbeck wrote so much of. I would love to come here again, after having read his works, and then visit the places, Salinas, Monterey, Cannery Row… Later, again, next time. So, we got to Monterey before noon, and followed the beautiful Monterey coastline. Wow, so beautiful. We stopped to take it in, and take some photos. Glad we did that. We continued on, and rode to highway 1. Big Sur! Also very amazing! The coastline is more hilly, but also more open that it is in Northern California, and Oregon. Highway 1, the coastal road to Big Sur. It did not disappoint! Amazingly beautiful coastline, hard to describe why it was so beautiful, or different from the kilometres of coast that we have already travelled, but, it was amazing. We did stop a few times along the way for some pics, so have a look at those at the end of this post. There was a lot of traffic on the road, folks just going down and back, as the highway closure is still in effect. We didn’t go down to see that, we just stopped at the town of Big Sur, and headed back up the coast. That was neat too, to see the same coastline in the opposite direction. At this point, we left the coast, Monterey to Salinas, and down to Atascadero. The Salinas valley is also very beautiful, through the farmland which extends up to the mountains on both sides of the highway. We were travelling very fast on highway 101; up to 120 km/hr, so it’s hard to truly enjoy and appreciate. Traffic moves quickly, but quite respectfully. Merges, passing lanes, all works quite well. Still gotta say, that freeway riding isn’t a ton of fun. Not nervous doing it, but if we could avoid it, we would! The next bit of coastline, if we keep going according to plan, will be the Gulf Coast in Mississippi. Next day, we travelled from Atascadero to Mojave. wow… We headed out from the dank Motel 6, and were able to avoid the freeway until after Bakersfield. So, we rode highway 58, a little bit windy, but not really; roller coaster, flat, and not, beautiful valley up in the hills. Landscape was rolling hills, must be sunny all the time b/c the California Solar Farm had thousands of solar panels set up there. Perfect motorcycle route, with the fun twisties, rolller coasters, and absolutely zero traffic on the road. It was just wonderful! It’s probably not sport bike friendly as the road is a bit beat up, and also can undulate a bit. After we left the pass, the roads were flatter, straighter, and with more traffic as we got closer to Bakertsfield. Just a side note, we are trying to eat cheaply, but on the road, we get what we can. We never eat fast food, but did get spicey chicken burgers from Wendy’s. $11US, – $14.77 CDN. Uggg! For two fast food burgers! Back to the road trip… We headed to Mojave, more amazing riding but a lot busier than the section from Atascadero to Bakersfield. Definitely more of a freeway, lots of semi trailers, and cars, moving quite fast up to 115 kms/hr or better. But, it was still amazing, going over the pass, 1200 metres, quite cool, lots of farmland, and quiet in spells, busier in others. Dramatic change in landscape, going over the pass; ranch and wine farms on the west, to the scrub desert on the other side. It was cool to cold going over the pass, down to six to eight degrees celcius, which is cold when travelling at 110km/hr. It’s very windy up this way. Thousands of windmill turbines greeted us as we turned towards the town of Tehachapi, close to the summit of the pass. Mojave is a little bit bleak. We walked a few kms and back to the grocery store, and there were lots of locked, gated properties, barking dogs, and not a very trusting or welcoming place. Not sure why, but the hotel owners here are very nice. In addition, we are very near to the airplane graveyard; and a cargo train corridor. So now, we’ll pack up the bikes and get to Death Valley this afternoon. To be continued! Thanks for the update! Nice to keep track of where you are and what it has been like.